Currently the Piedmont Progressive Farmers Group's primary focus is pastured, cage free brown eggs, which it aggregates from its members after they have been washed, graded and refrigerated on the farms of the individual members. 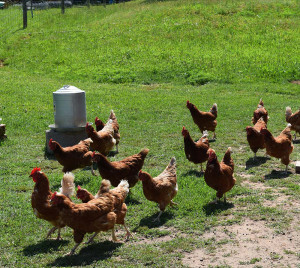 Among its members, the organization has the current capacity to deliver 300 dozen pastured brown eggs per week and has cultivated a number of buyers for its eggs at this level. The current plan in process will be increasing this capacity significantly. PPFG believes in the humane treatment of their laying hens and consequently expects that all members and other suppliers from whom they purchase eggs will follow the standards set by PPFG for the treatment of their laying hens. Eggs abiding by these standards will be marketed under the PPFG name as 'free range/pasture raised'. Because PPFG supports the values of sustainability and healthy food, PPFG also believes animals should not be fed animal byproducts or administered hormones or certain medications.